Today in Masonic History John Shields Tipton passes away in 1839. John Shields Tipton was an American politician. Tipton was born on August 14th, 1786 in what is now Sevier County, Tennessee. At the age of 17, he moved to Harrison County, Indiana. In Indiana, Tipton became a farmer. He also became prominent in the militia of the state. In 1811, he was in command of a unit of the Indiana militia that part of the 1,000 men force that future President, then Governor, William Henry Harrison took with him to meet with the leaders of a Native American Confederacy that opposed the expansion of the United States into Native American territories. When the Tipton and the other units arrived, Harrison had them camp just outside the Prophetstown which was the headquarters of the confederacy. Harrison met with Tenskwatawa one of the leaders of the Confederacy on the evening they arrived with more talks planned for the next day. Early the next morning warriors from Prophetstown attacked. The warriors were vastly out numbered and Harrison's forces were able to hold them off. After the battle, Prophetstown was abandoned, Harrison ordered Tipton and the other men to burn the town, destroying the town and all stores for the winter. The battle is called the Battle of Tippecanoe because of the nearby river. Harrison was nicknamed Tippecanoe after the battle and it inspired the campaign slogan "Tippecanoe and Tyler too." The following year when the war of 1812 broke out, Tipton became a major and was put in command of two companies. When peace was declared, Tipton received a promotion to Brigadier-General. 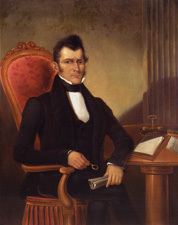 In 1818, Tipton entered politics and elected to the Indiana House of Representatives serving two terms ending in 1823. During his time in the House he sat on several commissions to establish a new state capital and worked to set the boundaries between Indiana and Illinois. In 1823 he was appointed as Indian agent for the Pottawatomie and Miami tribes. In 1831, Tipton was elected by the Indiana Legislature to fill the remaining time for a United States Senate seat which was vacated due to the passing of the sitting Senator. Tipton was a Democrat and strongly supported President Andrew Jackson. He was reelected to his own full term in 1832. While in the Untied States Senate he served as chairman of the committees for roads and canals and the committee for Native American Affairs. In 1838, at the request of Governor David Wallace of Indiana, Tipton along with a force of 100 volunteers went to Plymouth, Indiana. There Tipton enforced a treaty by forcibly removing 859 Pottawatomie. He started the group on their two month long march to Kansas where they were to be relocated. Called the "Trail of Death" it would be the largest single forced relocation of Indians in Indiana history. 40 people lost their lives on the "Trail of Death", most of them children. Tipton passed away on April 5th, 1839. Tipton was a member of Pisgah Lodge No. 32, Corydon. He was Worshipful Master of his lodge in 1819. In 1820 and 1821 he was the Most Worshipful Grand Master of the Grand Lodge of Indiana. He was also High Priest of the Logan Chapter No. 2, Royal Arch Masons in Logansport, Indiana.